Students - I am not a great gardener. I am not a good gardener. I am not a gardener at all, unless you count my weeds as flowers. But last week I looked behind the house and found these money plant stems growing as happily as could be. Instead of leaving them to be buried under snow (as I usually do), I picked them. When you look at the picture above, you can see the dried plant and two bowls. In the left bowl, you see the outer coverings of the shiny coins; each coin has a covering on each side, and the bowl is full of those. In the right bowl, you see seeds. 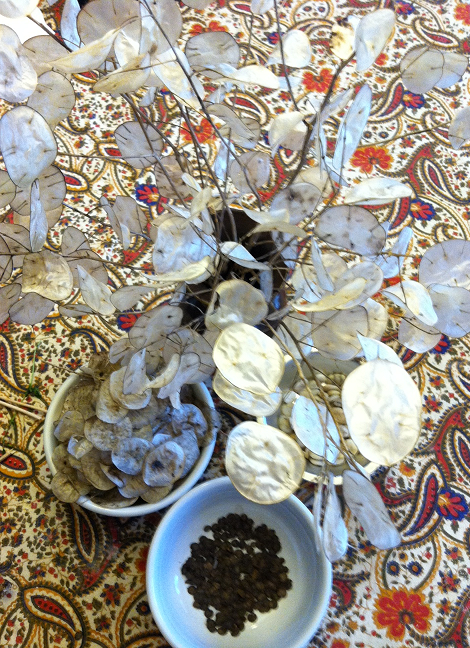 To deseed, I needed to gently rub my fingers over each coin, release the coverings, and then tap off the seeds. It was very calming, one of my favorite moments of the past several days. 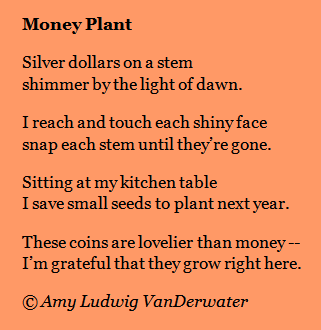 Today's poem is about a simple and meaningful action. What meaningful action have you taken lately? Brushed your dog? Fluffed your pillow? Filled a bird feeder? Such acts of work and love are very worthy of your poetry. Did you help make soup this week? Write about it. Did you sort some socks? Write about that. Always know that these daily actions, these pauses are full of meaning if only we notice it. If you think that your life does not already hold many of these actions of work and help and giving and connection, make one on your own. Go pick a small bouquet and place it in a jelly jar. Or write a note and stick it under your mom's pillow. Ask to help cook. Pick up litter or leaves. You will be enriched. Tomorrow, I will pick teasels! Then, I will place them on my front porch to greet anyone who visits. If you would like to grow your own money plant, you can purchase some seeds here through Burpee. Or, just ask a friend if you can have a few coins and release your own little seeds. 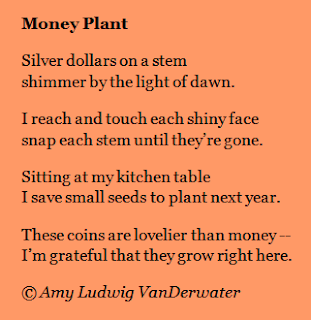 I hope to have quite a money plant garden next year. Yes, money DOES grow on trees! Teachers - if your class visits The Poem Farm from time to time, I would love to hear from you, to learn what is most useful and what you would like to see more of in this space. I welcome your comments below or e-mails to amy at amylv dot com. It is my hope to make this place useful for children, and I would love to feature more student work as well. I welcome you! I love that you allow us to search by technique. I am working with a student on making inferences and the personification poems have worked nicely for this.